Shoma Uno performs his short program at the 2016-17 Japanese National Figure Skating Championships. Despite the withdrawal of Olympic and World Champion Yuzuru Hanyu from the men’s event, the depth of the men’s field in Japan resulted in an exciting competition. Two-time Grand Prix Final bronze medalist Shoma Uno claimed his first ever national title, with Keiji Tanaka and Takahiko Mura rounding out the podium. Sitting in second place after the short program with two uncharacteristic mistakes on his quadruple jumps, Uno, the most decorated skater in the field, delivered a respectable free skate to “Buenos Aires Hora Cero” and “Balada para un loco” by Astor Piazzolla. Uno opened his free skate with his signature quadruple flip, which he stepped out on the landing. He also attempted two quadruple toe loops in the free skate, but turned out on the landing of both jumps. Uno came back strong from the mistakes in the first half of the free skate, and landed two triple Axels and four other triple jumps. The 19-year-old topped the leaderboard with 192.36 in the free skate and a 280.41 combined total, claiming his first national title. The student of Machiko Yamada and Mihoko Higuchi hopes to improve the consistency of his technical elements and performance quality going into the second half of the season. In the meantime, the teen from Nagoya is also preparing to add new quadruple jumps to his competition repertoire. The skater has also attempted a quadruple Salchow in training, but does not plan to put it in his competitive programs yet. Tanaka, the bronze medalist at this year’s NHK Trophy, skated a relatively clean free program. The newly-crowned Japanese silver medalist opened his free skate with an impressive quadruple Salchow and went on to land six other triple jumps, including a triple Axel-double toe loop-double loop combination. The only visible error in the program was on the landing of his third jumping pass, a triple Axel, which he under-rotated and landed on two feet. The 22-year old garnered 163.70 points in the free skate and a 249.38 combined total, putting him in second place overall behind Uno. Like Uno, Tanaka also had mixed feelings about his performances in Osaka. Mura, the 11-time Japanese national competitor, is the veteran among the medalists. Sitting in first place after the short program, Mura did not hold onto his lead after the free skate. 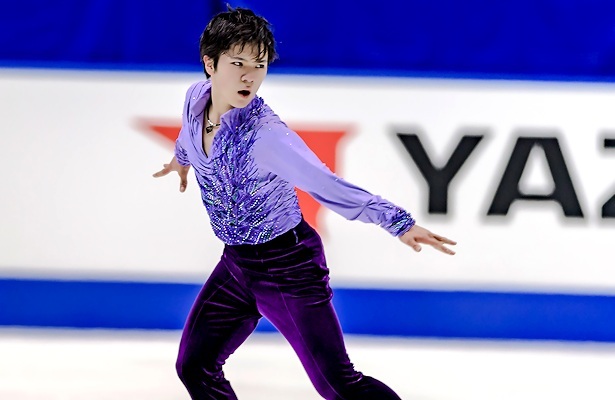 The 25-year-old opened his free program with two impressive quadruple toe loops, but had to step out on his triple Axel in addition to receiving an edge call on his two-footed triple flip. He earned 151.77 for his efforts in the free skate, and finished in third with a 242.11 combined total. Ryuju Hino, who sat in fourth after the short program, finished in fourth place overall with 230.31 points, while Kabuki Tomono and Shu Nakamura placed fifth (216.55) and sixth (202.16), respectively. The top two finishers, Uno and Tanaka, will be joined by Yuzuru Hanyu in representing Japan at the 2017 World Figure Skating Championships in Helsinki, Finland, this March.